The Beast of Gevaudan is a mythical creature that was held responsible for at least 60 animal-attack deaths in 1760s France (some reports put the death toll over 100, but there has been difficulty in proving more than about 60 of the cases). If there was a real animal behind these sightings and reports, it is obscured by a great deal of folklore. Locals believed it was a werewolf, or, more specifically, a sorcerer who shapeshifted into a monstrous predator in order to feed on human flesh. It was supposed to be bulletproof as well, until the day that someone tried a silver bullet. The Beast is a quadruped about the size of a horse. It reminds witnesses of a bear, hyena, wolf and panther all at once. It has a long wolf-like or pig-like snout, lined with large teeth. The ears are small and round, lying close to the head. The neck is long and strong. The tail somewhat resembles the long tail of a panther, but it is so thick and strong that the Beast uses it as a weapon, knocking men and animals down with it. Anyone struck by the tail reports that it hits with considerable force. The feet of the Beast are the hardest to describe. Some say that it has cloven hooves, or that each digit is tipped with a hoof. Others say that the claws are so heavy, thick and formidable that they merely resemble hooves. Since there do not seem to be any more sightings of animals like the Beast in France, or any historical precedent for animals like it in that area before the first sighting, it is a hard creature for cryptozoologists to tackle. Most mythical animals that are taken seriously by cryptozoologists have some sort of history that indicates that there could have been a breeding population from ancient times. Single animals are hard to handle from a cryptozoological standpoint. On the other hand, all available evidence seems to indicate that, if the Beast was real, there were at least two of its kind. If we wanted to, we might be able to presume that a mated pair or small pack migrated hundreds of miles to reach France from some area where such creatures did have a history, or that they were secretly or inadvertently transported by humans. Such speculations are far-fetched, but they would be necessary for most cryptozoological analyzations to succeed. The other alternative would be to presume that these creatures had been living secretly in France since ancient times without making a splash on local folklore, which doesn't make much sense for a supposed undiscovered species. It would be nice to be able to declare the Beast of Gevaudan a hyena, a bear, an escaped lion, or something like that, but in order to do so we must disregard witness testimony. Of course, in this case witness testimony is so riddled with the supernatural that we would have to disregard some of it anyway, but if we accept the core description of the Beast as having any validity, we must also acknowledge that the creature described doesn't match any known animal. Parts of it match wolves, hyenas and panthers, with hyenas probably being the best fit, but we run into serious problems when we try to bend witness testimony to fit a known animal. Unless we toss it all out as superstition, we end up with a Beast that certainly seems cryptozoological in the best sense of the word: it's a genuine puzzle. 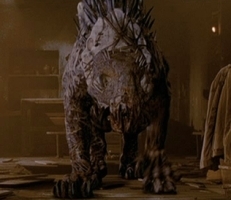 If the Beast existed and wasn't any normal species, what could it be? 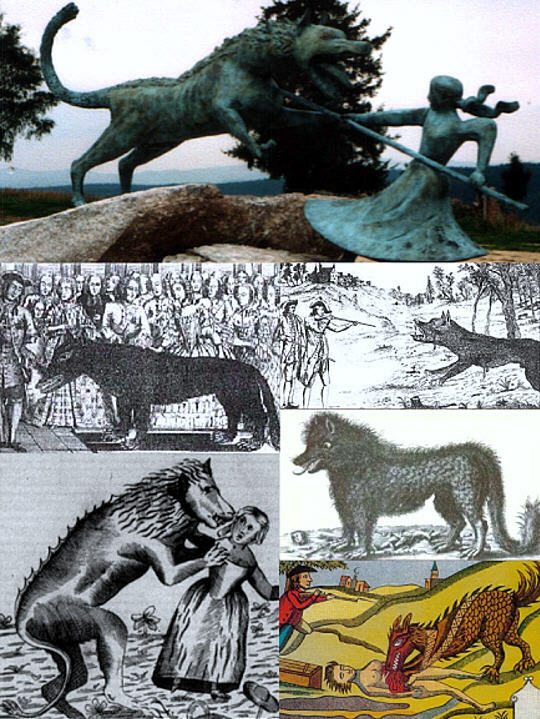 Most explanations put forth hybrid or deformed versions of the several known species that most resembled the Beast of Gevaudan. The idea of wolf-dog hybrids was popular for so long that it was almost accepted that the solution had been found. However, they would have to be pretty odd wolf-dog hybrids in order to adhere to the core description of the Beast. A weird bear mutant might work, if it were mutated in just the right way, but it would need a tail. Hyenas just are not big enough to be the Beast, so once again we would need to propose a mutant or hybrid, as well as the problem that hyenas have been extinct in Europe for a long time. Since cryptozoologists are only ultimately interested in discovering new species or subspecies, if the Beast was proven to be a mutant or hybrid of some kind, then it would cease to be of interest to cryptozoology. If the Beast of Gevaudan were a new species or subspecies, there are several possibilities. It could be a new bear, a new big cat, some sort of survival of a prehistoric European hyena, or something even more exotic. There is, in fact, a type of animal that fits the core description of the Beast exactly, but it is extinct, and would hardly be expected to have survived in Europe of all places. This group of animals would be the mesonychids, a presumably extinct group of hoofed predators. The biggest mesonychid looked much like a hyena, and was the size of a horse. Some other reports that may describe mesonychids come from Armenia and Assyria about the year 800, and describe pig-like beasts that are vicious predators, but these have huge, floppy ears instead of the Beast's tiny round ears. Another possible mesonychid is reported from a more plausible place, the Amazon rainforest of South America. This creature is called the tapire-iauara. As you can see, there are many explanations for the Beast of Gevaudan. Scientists run from one explanation to another as fads come and go. Almost everything that is remotely conceivable has been proposed as an explanation. This page has been limited to a discussion of the more likely prospects as viewed by the science of cryptozoology, because otherwise this web page would be the size of a small book. There are other explanations rooted more in fields other than cryptozoology, such as the study of folklore and hoaxes. For example, the fictional movie Brotherhood of the Wolf presents an elaborate explanation for the Beast that manages to neatly tie up most of the loose ends that frustrate scientists, by proposing that it was all an elaborate hoax.